So little time...: London Holiday Blog Tour ~ Guest Post, Excerpt & Giveaway! 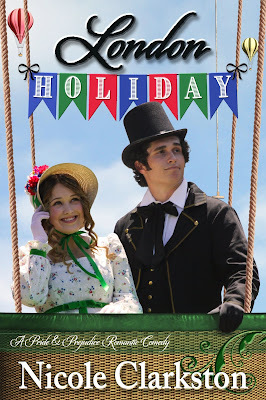 London Holiday Blog Tour ~ Guest Post, Excerpt & Giveaway! Hello, my friends! 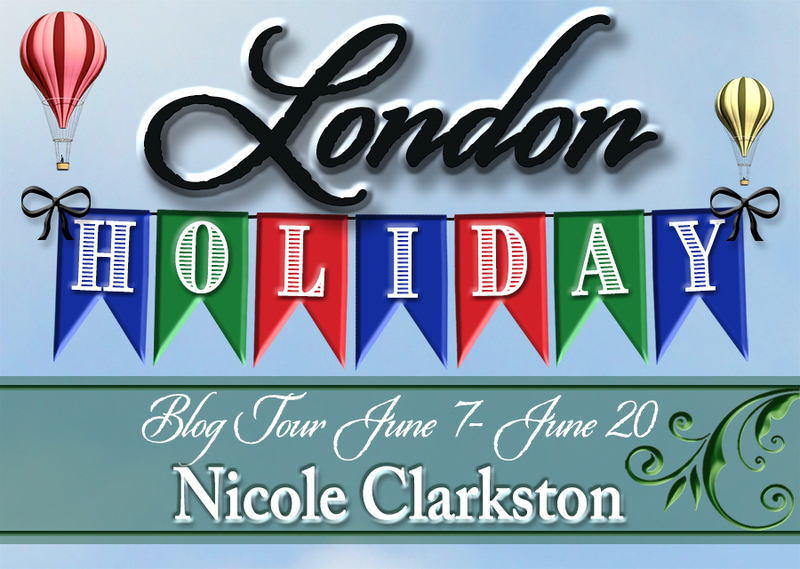 It's my pleasure to kick off Nicole Clarkston's London Holiday Blog Tour! WooHoo! I'm excited about this book! It looks like a fun read! 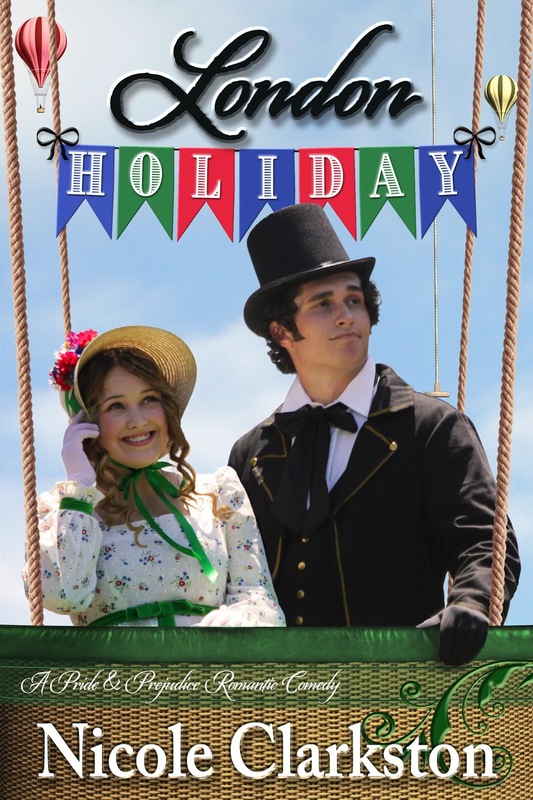 I hope you enjoy the guest post from Nicole and the excerpt from chapter six of London Holiday. Be sure to enter the giveaway! Details are at the bottom of the post. What Defines a Romantic Comedy? One does not need to look hard or long to discover that the hundreds of available JAFF works cover the gamut of scenarios and tones. They vary from sweet to dark, angsty to farcical, and all ranges in between. Some are plot driven, some are character studies. This wonderful variety of reading material only reflects back on the richness of the original source and the brilliance of Jane Austen’s pen. My very first JAFF, Rumours & Recklessness, took a somewhat average tone; neither broody nor comical, but somewhere in the middle. My second, The Courtship of Edward Gardiner, was a sweet, gentle story, and my third, These Dreams, ladled on the angst. Writing something that was intentionally light and breezy was a treat for me, but I did not realize until I was nearly finished that I had written a story that fit classically into the category of a Romantic Comedy. That phrase often triggers certain images for us as an audience; Tom Hanks and Meg Ryan, melting ice cream and runaway puppies, dates gone bad and embarrassing situations that magically resolve themselves. We adore the formula of Boy-meets-girl, Boy-loses-girl, Girl-declares-she-will-never-dance-with-boy, Boy-tries-to-impress-girl-but-insults-her-instead… wait, that’s another book. It is a popular genre because we all want to believe in the kind of love that can withstand a little bit of life, but we also enjoy some escapism in the process. Let’s take a look at some of the common devices and characteristics of a RomCom. One of the first dead giveaways is the “Meet-Cute.” You don’t see it every single time, but it’s so common that we all wait with bated breath for the fateful early clash to kick off our couple’s relationship. I love the Urban Dictionary’s definition: “Scenario in which two individuals are brought together in some unlikely, zany, destined-to-fall-in-love-and-be-together-forever sort of way (the more unusual, the better).” Doesn’t that sound like so many of your favourite P&P variations? In many of these meet-cute scenarios, we see one or more of the following: 1)Embarrassing or highly unusual situation for one or both main characters; 2) Mistaken identity; 3)Misunderstood intentions; 4)Foot In Mouth syndrome. Without realizing it, I had written all these situations into Elizabeth and Darcy’s first meeting. We have Darcy, drugged and not thinking clearly, practically sleeping on the street; Elizabeth assuming he’s a footman; Darcy awakening with a zinger of a hangover and assuming the worst; Elizabeth insulting him afterwards. That brings to mind another frequent device of the RomCom—a reversal of circumstances. Sometimes we see disguise (bingo), dressing or acting above or below your usual means (yep), and role reversals. One of the things I enjoyed playing with was flipping some of our couple’s expressions from canon and putting their words in each other’s mouths, such as a version of the infamous Assembly Insult that came from Elizabeth. Also, since this book was, in a way, a homage to Roman Holiday, it was fun to have our male lead as the one drugged and helpless, and our clever heroine as the one who rescues him. A Romantic Comedy should be both romantic and… well, a comedy. We meet two people who are obviously destined to be together because they are better together than they are apart. The world just does not make sense if they are not together! However, getting them there is never a walk in the park (oh, yes, you usually see parks or some other relaxing venue in a romcom, even if only briefly). Physical comedy is a common element. I’m sure you can think of some hilarious (and sometimes mortifying) examples from your favourite movies (Ben Stiller comes to mind). In London Holiday, Darcy is challenged by ill-fitting attire, and we see him suffering the indignity of riding on the back of a coach like a footman. Elizabeth has a few discomfiting moments of her own. It seems that one of the distinguishing characteristics of a promising love affair is finding someone who will bear with your sufferings with patience (even if they are secretly squealing with laughter over them). Usually, both our hero and heroine have extenuating circumstances and a lot of learning to do, and often they can be put into some awkward situations because of it. The conflict they each bring to the table heightens the conflicts they have with each other, until somehow, they finally clear the air and discover that together, they can surmount the odds. The entire love story then focuses on this point: they complete each other, and all the struggles they began with are either resolved or found to be not so terrible, after all. You can’t have a Romantic Comedy without some banter. Jane Austen was the master of this, and you might say she almost invented the RomCom genre, but for the fact that her books were so much more. Here, we examine only a snippet of her genius and try to spin that chemistry into new situations. London Holiday is thick with dialogue between our couple. They have almost no one else to turn to and are forced to discover in one another someone that they can trust, can laugh with, and even speak of serious issues with. It is this intimate exposure that allows them to very quickly break down their reservations and doubts. They do not always agree, but they do learn to respect each other. The emotional tone is vital to a successful story. By “successful,” I mean convincing the reader or viewer that it could happen, however unlikely, and establishing a sense of anticipation. The story should feel like a sunny day with scattered clouds, not a thunderstorm with hail. I have always loved the feel of a well-executed Romantic Comedy, because it is a microcosm of real life without quite so much of the grit and grime. It is a comforting place to escape to, even as I fret about whether our dear couple will really figure things out. Nearly always we have some kind of climax, where the couple’s misunderstandings threaten to tear them apart. However, and happily for us, all that is good and noble and just in the world prevails, and somehow, they find each other again. Usually some grovelling is involved, but in the end, to paraphrase Mrs Bennet, we knew how it would be. Lessons are learned, annoying relatives are vanquished, hearts are changed, and the future looks bright and rosy. Before you accuse me of pink sunglasses, let me clarify: I get it. Life is hard. Things don’t always work out, and problems keep cropping up after we thought we had them tackled. But isn’t that part of the fun of peeking into another world for a time, where we can walk away believing that true love really can prevail? We look at the person beside us and perhaps we smile more kindly, speak more gently, and look ahead of ourselves, at least for a time, a little more hopefully. “Romantic Comedy.” Merriam-Webster, Merriam-Webster, www.merriam-webster.com/dictionary/romantic%20comedy. “Romantic Comedy.” Wikipedia, Wikimedia Foundation, 28 May 2018, en.wikipedia.org/wiki/Romantic_comedy. Mernit, William. “Romantic Comedy Writing Secrets.” Connecting with Audiences Through Character Emotions, www.writersstore.com/romantic-comedy-writing-secrets/. At least the shoes were an improvement. Darcy had also traded his hat for one belonging to Fitzwilliam’s batman, hoping that the nondescript chapeau would lend him a bit more anonymity. He had no notion where he was to go or what he was to do, and Fitzwilliam had been blasted little help. Somehow, he must find a way of speaking to Wilson, and learn what could be said in his own defence. Surely there was some other who could testify to the conspiracy his aunt had brought to his own household. But how to prove his location last evening? The only persons capable of vouching for him would be those who did not even know his name. Darcy shuddered. There were a great many things he would rather do than go back to that tradesman’s house, announce his identity, then beg for a witness to his presence. There were two single ladies living in that house, and he did not wish to become their prey any more than he wished to be shackled to his cousin. He marched aimlessly down the pavement, his mind focused on his walk only enough to be certain that he was not noticed by anyone who might recognise him, when a flash of inspiration dawned. Hertfordshire was only half a day’s ride, and he had more than enough pocket money with him to hire a mount. He could ride fast and hard to Bingley’s newly leased estate and establish himself as a guest there. He had been intending to journey there the following week anyway, and Bingley would be only too happy to have the house opened to him early. However… the notion passed when he realised that in the eyes of the ton, fleeing Town at this precise juncture would be as good as an admission of guilt. No, he must face his aunt to contradict her falsehoods, and he needed information. He dared not count upon his uncle’s assistance, either. He rounded a corner and paused upon noting a familiar carriage just setting down its passenger on to the same street. Heaven forbid, it was Lord Wexley’s execrable wife! Darcy glanced about for a doorway into which he might slip, but every one of those would lead him into a shop where people could see his face even more closely. He turned about, glancing only once over his shoulder to see where the lady had moved after her carriage had set her down. Before he had fully turned back to his path, he collided headlong into a wall of parcels, seemingly all shrouded in a frothy array of cream satin and lace. “I beg your pardon!” cried a sickeningly familiar voice. His apology was automatic, and he was already reaching to pick up the boxes he had crashed into when he looked up at the faces of the young shoppers. If Fitzwilliam Darcy had ever wished to be swallowed up by the pavement or disappear into a nearby shrubbery, this was the moment. “If you have,” the lady returned, “I would think it a poor performance on the part of the hat box. I am certain it has managed to serve its office.” She sighed very lightly, an expression of teasing exasperation, and held out her hand to receive the box. “Make way!” grumbled a sour voice behind him. Darcy started. He turned about and looked full into the face of Lady Wexley, who had apparently destined that very same millinery shop for her own custom. Darcy felt his stomach lurch, and his toes curled in dread. She could never fail to recognise him, particularly not after the way she had repeatedly thrown herself into his path last season before Lord Wexley had claimed her hand. He closed his eyes and prepared the explanation he knew would be demanded, but she only groused in the direction of the two young ladies. “Have your footman stand back!” she hissed at them. The rest of her words were offered to the benefit of no one in particular, and everyone in general, so that all might appreciate her lament. “Abominably rude, these tradesmen’s daughters. Walking about town with a strapping footman in counterfeit colours and putting on airs as if they were gentlemen’s daughters! It seems that simply anyone may now shop in this part of town,” she sniffed. She passed on by Darcy as if she had not even noticed him, and he began to breathe… only very faintly. She had not recognised him! She would not even look at him, clad as he was! His heart began to beat a little more quickly. Oh, the possibilities! The dark-haired minx before him did not seem at all put out by her abuse at the hands of Lady Wexley. She appeared, rather, to be struggling mightily against an outburst of laughter. Her eyes danced, and she was obliged to tip her face slightly away as a distinct snicker escaped her. He gave her the parcel, realising only after she had taken it that he was puzzling curiously over her face. Was it the pert little nose, so unfashionable in the finer circles, or the faint crease in her fair skin where a wider smile lurked behind the demure one? Perhaps it was simply the shape of her cheekbones—high yet soft—contrasted with the sharp intensity of her dark eyes, which was so interesting to look upon. He opened his mouth to make a reply but could think of absolutely nothing to say. He abhorred disguise, and her presumptions, if he were to verify them, would be the worst trail of lies imaginable. But the truth—the truth was even more wretched! He settled instead for diversion. She stared at him with some incredulity, her brow furrowed and her head shaking faintly at his audacity. “Well,” the younger girl spoke up for the first time in some while, “he certainly knows how to be chivalrous when he wants to be, Lizzy.” To this, she added some mischievous grin, which remained a mystery to Darcy, but ‘Lizzy’ seemed to understand perfectly. Elizabeth tried not to show her disappointment. Her aunt and uncle were the most gracious hosts, and she would not wish to seem ungrateful. “Thank you, Aunt, but it is no matter. I will wait to speak with him when he returns.” She stepped back toward the door, but her aunt’s voice stopped her. “Of course, Aunt.” Elizabeth reached down to give her youngest cousin a playful embrace and watched wistfully as her aunt rose to go speak with the nurse. She sighed. Now, what was she to do with that footman who was waiting below stairs? And why was it that he had considered it such an insult when she had asked him to wait in the kitchens? He should have counted it a hopeful sign, but instead, had clearly struggled against a vocal protest that he was not invited to the drawing room. Perhaps she was, indeed, wasting her time with him. After all, how often did a servant expect to speak directly with the master when he applied for employment, yet had she not attempted to secure him such an interview? He had not even a written character by his former employer! She was doing him a favour, offering to speak on his behalf on so little inducement. After all, what had he done for her, apart from knocking down her parcels? Well… he had picked them up again. And carried them—badly, but his only complaint had been an entertaining assortment of grimaces and scowls. She tried to forget how gallantly he had shielded her from the dirtier parts of the street, or how he had suggested a safer route for her to walk home. He was only trying to impress her in hopes of employment, surely, but there had been about him an air of command which would suit his prospective post ill. He ought to be inquiring at the Army instead of a household, but perhaps he would like taking an officer’s orders even less than an employer’s. Kitty cleared her throat and coughed, smirking all the while. Elizabeth, filled with a sudden sense of foreboding, turned around. Her mysterious stranger had apparently broken the injunction to remain in the kitchens and had not only found her out but had heard every word. “You would not have been so embarrassed if you had not spoken so ill,” Kitty pointed out—perhaps the most sensible observation she had uttered in the past six months. Nicole discovered Jane Austen rather by guilt in her early thirties―how does any bookworm really live that long without a little P&P? She has never looked back. A year or so later, during a major house renovation project, she discovered Elizabeth Gaskell and fell completely in love. Her need for more time with these characters led her to simultaneously write Rumours & Recklessness, a P&P inspired novel, and No Such Thing as Luck, a N&S inspired novel. The success she had with her first attempt at writing led her to write four other novels that are her pitiful homage to two authors who have so deeply inspired her. Nicole contributes to Austenvariations.com, a group of talented authors in the Jane Austen Fiction genre. In addition to her work with the Austen Variations blog, Nicole can be reached through Facebook at http://fb.me/NicoleClarkstonAuthor, Twitter @N_Clarkston, her blog at Goodreads.com, or her personal blog and website, NicoleClarkson.com. It's giveaway time! For this blog tour, Nicole is generously giving away EIGHT eBooks of London Holiday to eight lucky winners! The giveaway is open internationally. To enter, fill out the Rafflecopter below! Only one eBook of London Holiday per winner. Eight readers will be picked. Each winner will be randomly selected by Rafflecopter. Many thanks to Nicole Clarkston for stopping by here today, and for her generous giveaway! I loved learning more about Romantic Comedies. Also, a big thanks to Janet Taylor @ More Agreeably Engaged for organizing this tour! Are you looking forward to reading London Holiday as much as I am? Thanks, Candy, for hosting. Love this chapter with the 'tolerable' comment in reverse! What a neat twist for Darcy to hear it said about him. This book is such fun and romantic! I too, enjoyed learning more about Romantic Comedies. Thank you, Nicole, for the enlightening post. Congratulations on your new release and best wishes. You're welcome, Janet! I caught that 'tolerable' comment, too! Haha! Yes, I think London Holiday will be a fun and romantic story, as well! I'm really looking forward to reading it! I am so looking forward to read more. It was funny that Elizabeth was the one to insult Darcy, hehe. Congratulations on your new book, Nicole! This book sounds wonderful! Thank you for the great review. I hope you enjoy it, Eva! Thanks for stopping by. Thanks for such an interesting piece about romcoms, Nicole, and for sharing this lovely long excerpt with us. Like the others, I love the way you turned around the "tolerable" comment. Good luck with this new book! Thank you, Anji! I had a lot of fun upsetting the apple cart. I hope you enjoy it! What a lovely (and fun) excerpt! Excited to read this book. Thanks for the giveaway! Thank you, Priscilla! Good luck in the giveaway! I enjoyed the excerpt and absolutely love romantic comedies so I am looking forward to this book. Halfway through reading this, I thought, "Roman Holiday!" It's on the top of my all-time fave movies list, and this book reminded me of it! Woo-hoo! Thanks, Nicole and Candy! I think it's fair to say that your story has ticked all the essential elements required of a romantic comedy!!! Must say that I absolutely adored this story and the very different perspective we get on Lizzy and Darcy during their jaunt through London!! I also loved the part our dear Colonel played as he was the perfect foil to Darcy. The premise of this story is very funny and the idea that the proud and haughty Mr Darcy could end up dressed as a footman,asleep on the streets of London is enough to give us all pause for thought!! Best of luck with your book,Nicole! Thank you, Mary! Our dear boy is just so much fun to torment, isn't he? Heh heh, excellent excerpt! You already know how much I am looking forward to reading this book! Wow, this is quite a detailed and in-depth analysis of what romantic comedy is all about. I adore the excerpt as well. It's humourous to think that Darcy would resort to dressing as a footman (no matter the circumstances) but not acting like one. This will definitely give him away if he's not careful. Wow. Role reversal for that comment is, I believe, unique in JAFF (at least, I don't remember any). What a lovely analysis by the definition and traits of romcom genre. Thank you for the chance in the giveaway! I am glad you enjoyed it, Agnes! It was fun flipping things around a little bit. Good luck in the giveaway! Were winners announced for this giveaway? Catherine Blog Tour ~ Excerpt & #Giveaway!